Last week, we kicked off a brewery tour of Wisconsin with a look at where you can find Sunset Hill Stoneware at breweries in the northeast, including Green Bay and the Fox Cities. 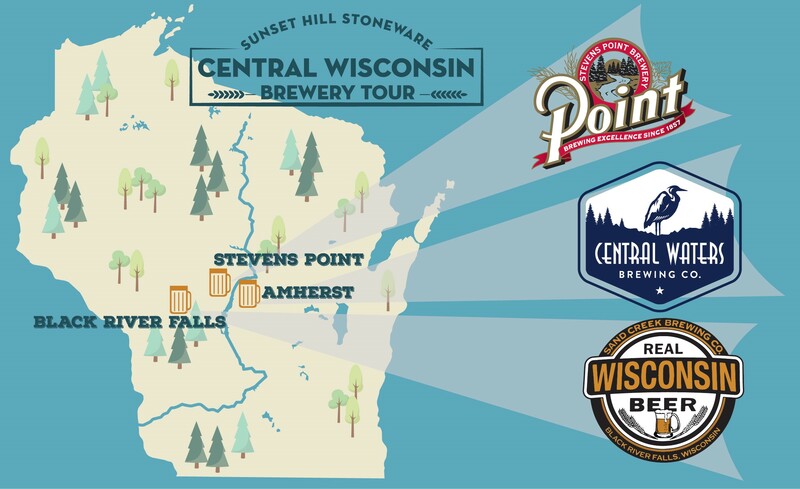 The tour continues today as we take a look at where you can find our mugs and steins in central Wisconsin, including Stevens Point and the surrounding area. We've been supplying our steins and mugs to breweries throughout the area for years in some cases. The central part of Wisconsin is dotted with small towns tucked into the natural beauty of the marshlands and the eastern parts of the Driftless region, marked by rolling hills and valleys for scenic driving. As small as they may seem, many of these towns host breweries that serve up customized Sunset Hill Stoneware beer steins and mug clubs for their biggest fans. Some have even gained recognition at beer tasting competitions on a global scale. Please enjoy these central Wisconsin delicacies responsibly. Stevens Point Brewery is a mainstay along Water Street in Stevens Point, located just a few hundred yards from the Wisconsin River. It has the distinction of being the fifth oldest continuously operating brewery in the United States, operating for more than 160 years through the Civil War, prohibition and the Great Depression. Stevens Point Brewery produces seven of its beers all year long, so you'll easily be able to find options like the Classic Amber Lager, Beyond the Pale IPA and Drop Dead Blonde no matter when you visit. But, during the summer, you can also sample a glass of the Point Beach Pilot, a strawberry wheat ale that's only available until the end of July. The brewery also supplies an IPA variety pack with four different flavor options for the adventurous. On top their alcoholic selections, there's some good news for your friends who don't drink. The brewery also supplies six types of house-made sodas, including root beer, vanilla cream and fruity flavors. 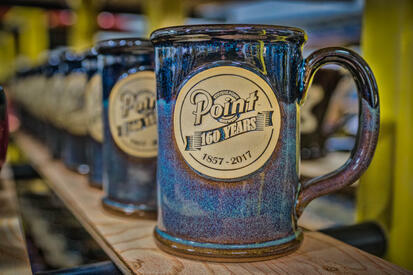 Stevens Point Brewery has many different varieties of our American-made custom stoneware for sale. Among its offerings are the Double Barrel stein, the Wide Mouth mug and even the Little Shooter to lift your spirits; and that's just the beginning of the handmade coffee mug selections. All of these and more of our styles are emblazoned with Stevens Point Brewery's unique medallion and cannot be found for sale anywhere else. Tucked away in the town of Amherst, about a 25-minute drive southeast from Stevens Point, Central Waters Brewing Company serves a huge host of beers, some of which are barrel-aged just like in the olden days. 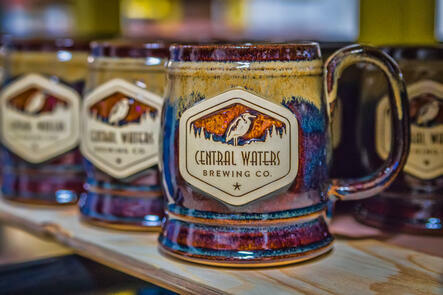 Central Waters Brewing Company has a host of beers from all over the spectrum available at any time of year, from the Honey Blonde cream ale to Mudpuppy Porter. There are also plenty of seasonal offerings to choose from, plus some special releases aged in oak bourbon barrels. For example, the Vanilla Bean Bourbon Stout will only be released in June, and the Rye Barrel Stout will come out exclusively in August this summer. Aside from their huge myriad of craft beers, Central Waters Brewing Company goes to careful lengths to be one of the greenest breweries around. Some of the steps they take toward eco-friendliness include using two solar panel arrays to reduce their power consumption, supplying bottles from the greenest glass manufacturer in America and sourcing local barley and hops, sometimes grown less than 30 minutes away. Central Waters also has the Dale Barrel stein available with its heron standing watch on the medallion in four different color options. Be sure to visit the brewery this summer to ask about these custom beer steins. 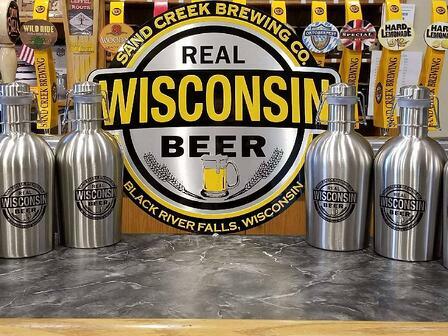 Further afield in Jackson County, after a scenic drive along WI-54, you'll find Sand Creek Brewing Company, located in an historic building in Black River Falls that has hosted several breweries since the mid-1850s. Sand Creek Brewing Company produces a dozen different beers and other alcoholic drinks throughout the year. Naturally, since Wisconsin grows more cranberries than any other state and a significant amount of those come from Jackson County, the brewery also supplies cranberry-flavored treats, including a special hard lemonade available from July through December. Other hard lemonade and ale flavors are also available, making for the perfect thirst-quencher if you find yourself visiting on a hot summer's day. While you're visiting Sand Creek Brewing Company, be sure to ask how to join their mug club. Members of the club can access the company's exclusive Sunset Hill Stoneware handmade coffee mug, complete with a special medallion for mug club members each year, plus other benefits not accessible to mug club members. Stay tuned for the next leg of the Sunset Hill Stoneware Brewery Tour through Wisconsin, where we'll visit some of our favorite breweries in southwest Wisconsin, including the craft brewery bastion that is Madison.